fficiency is still in the development phase. 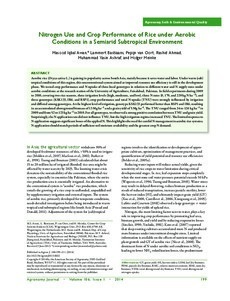 We tested crop performance and N uptake of three local genotypes in relation to different water and N supply rates under aerobic conditions at the research station of the University of Agriculture, Faisalabad, Pakistan. In field experiments during 2009 to 2010, covering two rice seasons, three irrigation levels (high, moderate, and low), three N rates (0, 170, and 220 kg N ha�/sup>), and three genotypes (KSK133, IR6, and RSP1), crop performance and total N uptake (TNU) were strongly influenced by irrigation and differed among genotypes. At the highest level of irrigation, genotype KSK133 performed better than RSP1 and IR6, resulting in an accumulated aboveground biomass of 13 Mg ha�/sup> and a grain yield of 5 Mg ha�/sup>. The TNU ranged from 34 to 126 kg ha�/sup> in 2009 and from 52 to 123 kg ha�/sup> in 2010. For all genotypes, we observed a strong positive correlation between TNU and grain yield. Surprisingly, the N application rate did not in influence TNU, but the high irrigation regime increased TNU. The limited response to N application suggests significant losses of the applied N. This highlights the need for careful N management in aerobic rice systems; N application should match periods of sufficient soil moisture availability and the greatest crop N demand.